Custom rugs for hotels and hospitality spaces, including bespoke lobby rugs and large volume orders for bedrooms and suites. 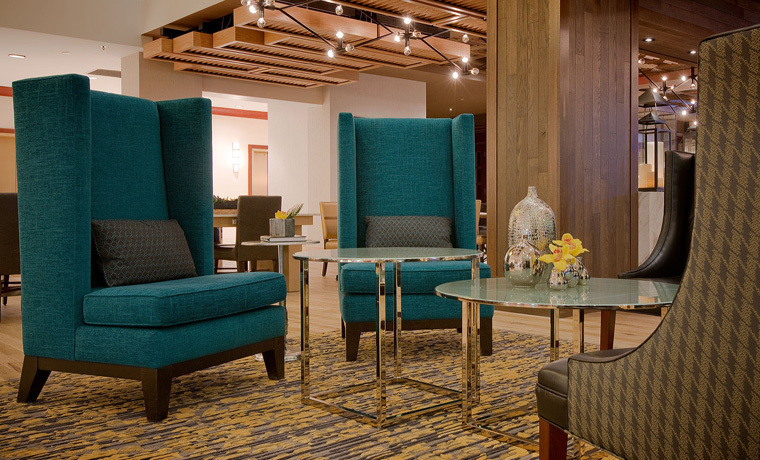 What could be more important in the hospitality sector than providing a welcoming foyer or luxurious presidential suite? 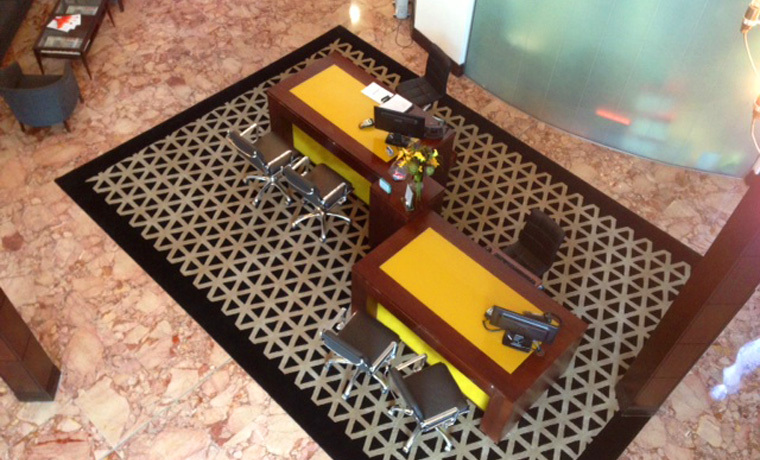 Let Loophouse design rugs for your reception or presidential spaces and present your customers with a truly unique welcome. 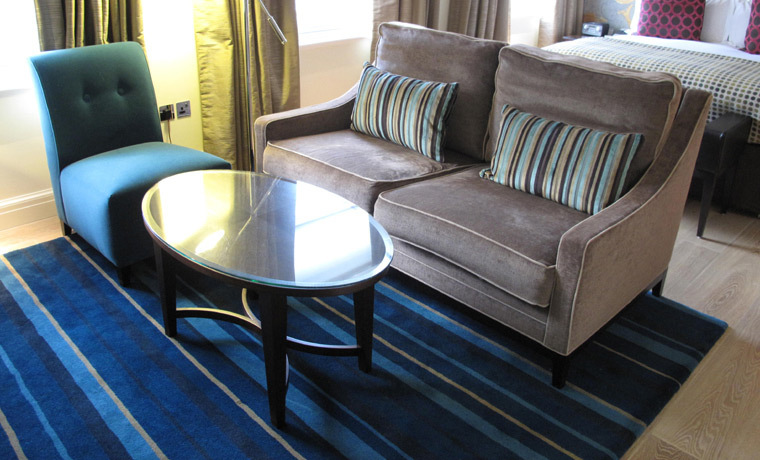 Loophouse also has the capabilities to meet large volume orders; in the past completed projects include furnishing 160 bedrooms for a New York hotel with co-ordinated high quality rugs. We are experts in producing luxury rugs for high-traffic environments, and can combine vital practicality with style and design flair. The exquisite Glasshouse hotel is the perfect marriage between classical architecture and modern interior design. Loophouse rose to the challenge of merging these two elements just as successfully by combining the contemporary Loophouse, Signature collections with a rich colour palette. Originally presenting an array of rugs for both lobby and bedroom suites, ten years later the client returned to ask Loophouse to replace the rugs with a more modern and monochromatic twist to enhance the hotel’s refurbishment. 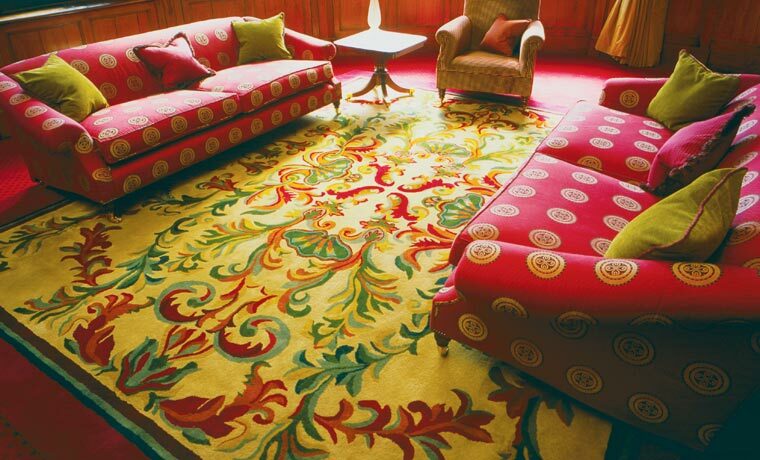 The floral Kiele design from Enchanted Garden collection was the starting point for these rugs. A dominant and structured granite line runs across the delicate golden Kiele design - offering a more graphic approached, which was then combined with a contrasting colour palette. These images are available for press with credit to the photographer Ron Ngiam. The Arch London is an 82 room hotel in Georgian Grade II listed buildings, offering luxury in view of Marble Arch. Working with the interior designers RDD plc, loophouse co-ordinated bespoke rug designs, resulting in a beautiful collection of 12 handmade rugs. The 'Eliza' rug features in the Martini Library, while a 'charcoal to concrete' Alchemy gradation sets a calming influence in the Study. 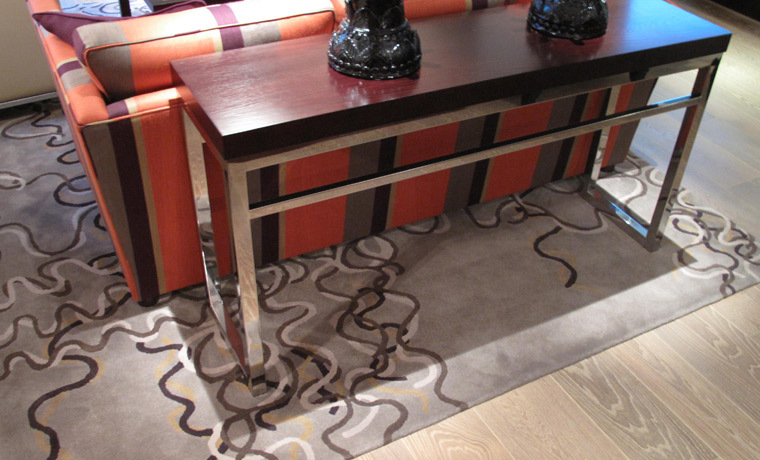 The 'Kura' rug meets design pieces from the likes of Tom Dixon and Philippe Starck in Le Salon de Champagne. Loophouse rugs are located in all nine of the individually styled bedroom suites, representing the design and colour capabilities of loophouse custom service. Using designs from loophouse signature collections - Hidden, Woodland, Savoy and Enchanted Garden - each custom rug complements its surroundings. The unique atmosphere of this magnificent Victorian hotel was brought to life with an eclectic interior re-styling which introduced a fresh, contemporary twist to a traditional and venerable institution. 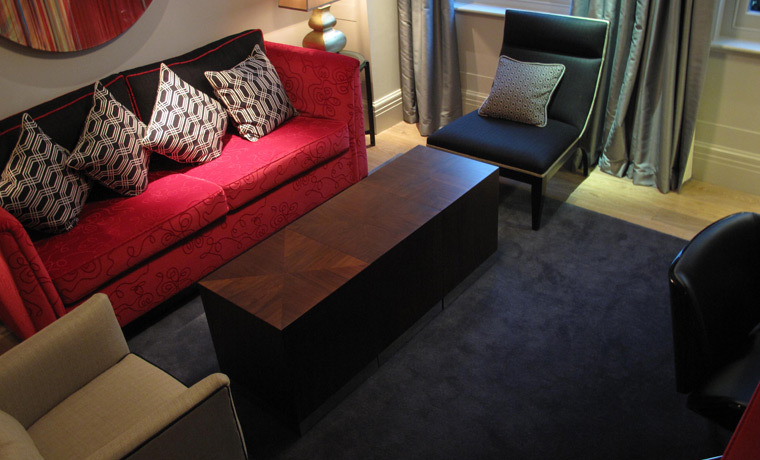 Loophouse designed and produced several fully bespoke area rugs for the bedroom suites and reception areas - all were individual but all had one thing in common: they were contemporary and vivid but harmonised with the majestic mood of their setting. Loophouse produced a series of bespoke rugs for the University of Orgeon, University of Nebraska and NCAA. Custom rugs designed specifically to the universities logos and colours. 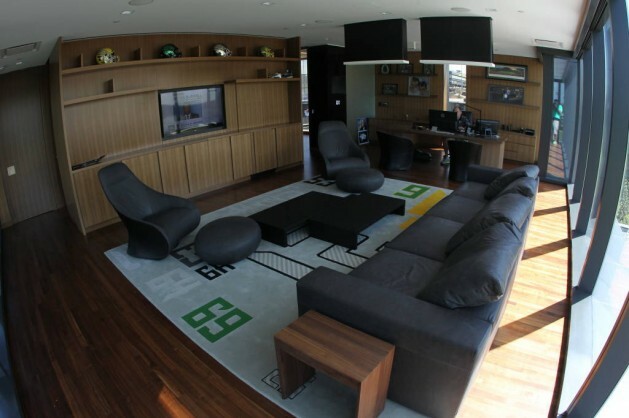 These rugs demonstrate the graphic capabilities available with Loophouse handmade rugs and carpet.